The spring holidays are upon us! Whether you celebrate with a religious event or you simply want to enjoy the season, here are some great Spring home decor tips with a few fun extras. Spring is all about new birth and growth, so that means lots of blossoms and baby animals (chicks, bunnies, etc.). It’s also the season of pastels such as pink, lavender and light blue. 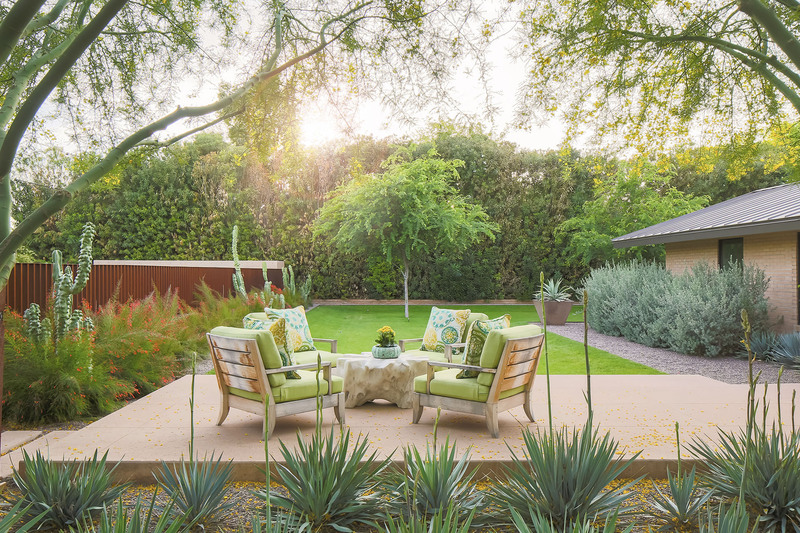 There are several approaches to this – one is an all-out burst of spring around your home. This basket with luster eggs is a great example of what you can do as an easy welcome to guests at your doorway. 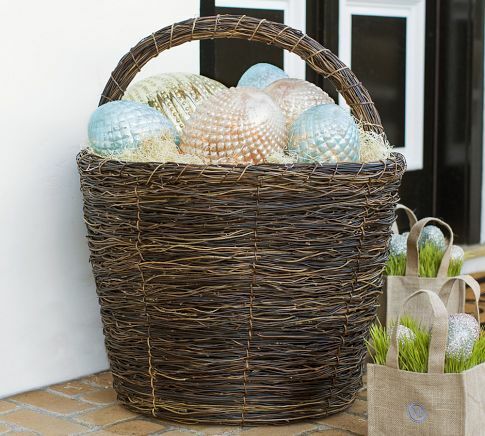 Once the season ends, you can pack away the eggs and fill the basket with live plants or summer-themed items. 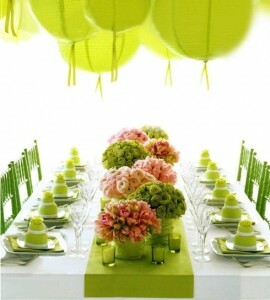 But if the eggs and pastels strategy doesn’t appeal to you, there are more subtle ways you can greet spring. 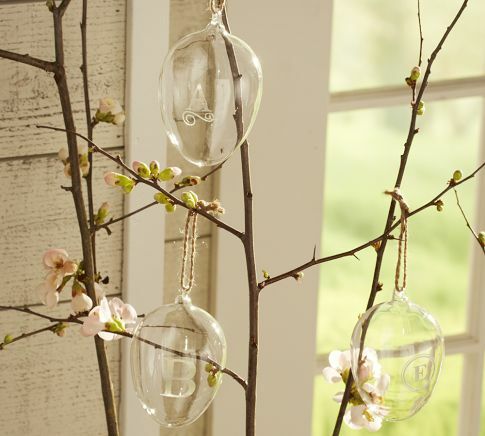 These monogrammable blown-glass eggs are season-appropriate without being too precious. 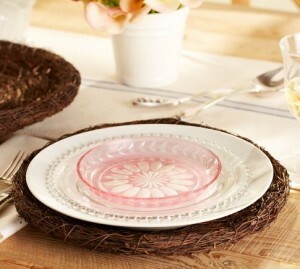 And these nest-style chargers bring the season to your dining table in an understated way. 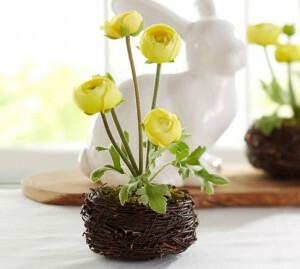 Fresh plants and flowers are integral to spring decorating but not all of us have a green thumb. Consider adding silk plants that speak to the season – this ranunculus flower, which only grows in spring, is a terrific choice. If you have a more contemporary style, think outside the box a bit for your spring décor. I doubt lime green comes to mind as a traditional spring color scheme, but look at how this tablescape screams spring without delving too far into pastels. If you have children in your life, spend a Spring Break day at Color Me Mine, painting porcelain eggs you can then display in your home. Or do other crafts at home that you can incorporate as holiday décor to provide family memories for years to come. We at Tracy Lynn Studio wish you a beautiful and healthy spring! If we can assist in any of your decorating or remodeling needs, please contact our San Diego design firm for a complimentary consultation.